Today’s the day. I think. The final hurdle has to be Kevin Kolb’s new contract. Hopefully that will get settled shortly. My prediction, once again, is Kolb for Rodgers-Cromartie + Arizona’s 2012 2nd round pick + another conditional middle round pick. Can’t promise the same kind of strange happenings as yesterday, but hit it here for updates as we go along. 9:54 am - Eagles sign Jason Babin to a 5-year deal (Jay Glazer), worth $28 million (Jim Wyatt). There’s your new defensive end. However, as Sam Lynch points out, this is probably a front-loaded deal. No one should expect Babin to still be on the team in 2015, when he’ll be 36. Time to see if Babin just had a fluke season or if Jim Washburn really discovered his talent. 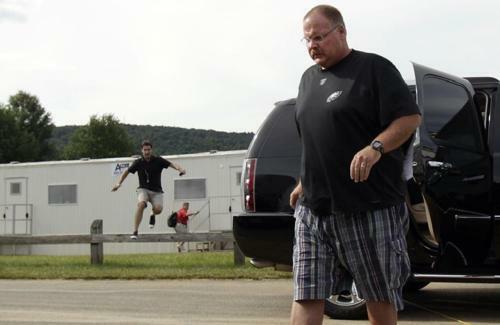 Photo: “Chasing Andy” from and of Jeff McLane. Tagged with Philadelphia Eagles, NFL, Free Agency, Kevin Kolb, Rumors, Trade, Arizona Cardinals, Dominique Rodgers-Cromartie, Jason Babin, Defensive End, Contract. July 28, 2011 by Brian Solomon.